Animals need protection against hazardous weather conditions such as extreme colds or drop in temperatures. Your role as the pet owner is to give shelter and warmth to your pets to keep them safe against dangerous winter storms. South Bellmore Veterinary Group, as a group who takes care of animals as if they’re their own, would like every pet owner to better protect their pet and maintain its best health. 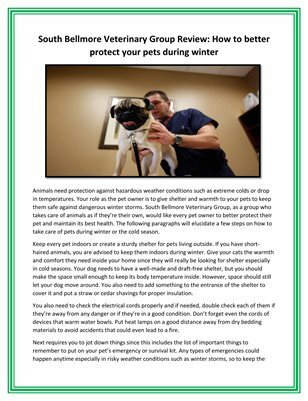 The following paragraphs will elucidate a few steps on how to take care of pets during winter or the cold season.